Have you wondered why our ancestors ate most of their food in silver plates and drank water from copper utensils? By now most of us know that storing drinking water in even the best quality plastic bottles really poses a serious potential health hazard. So, while they are convenient, cheap and an indispensable part of our modern lives, most modern research shows that reusing plastic results into the leaching of chemicals into the water. Recent researches show that pregnant women exposed to Bisphenol A (BPA) in large amount can lead to low birth weight (LBW) in newborn children. It is also linked to hormonal disorders, obesity and also shown to affect the brain and behavioral development. It is indeed high time that one really considers replacing all the plastic vessels and bottles with glass, steel or copper bottles. While glass is wonderful, storing water in glass vessels and bottles may be impractical as they could break when the bottle is washed or cleaned regularly by slight negligence. 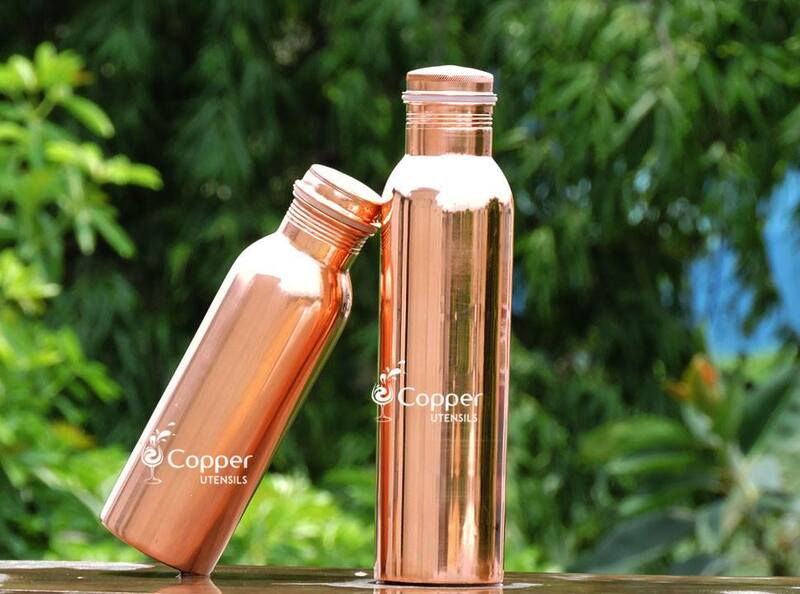 A one-time investment, the copper vessel might be slightly more expensive but unlike plastic, glass or steel bottles, copper is an essential trace element, which is a critical nutrient to the human body. This health fact has been mentioned in the ancient medical texts of Ayurveda. According to Ayurveda, water stored in a copper vessel has the ability to balance all the three main doshas in the human body, (Vata, Kapha and pitta). The storage process is known to kill all the micro-organisms that include virus and bacteria, which are otherwise known to breed in plastic bottles which make it the ideal accompaniment for drinking water. Copper is indeed reported to destroy any stomach ailment causing bacteria, such as Vibrio Cholerae, enteropathogenic E. coli, and Salmonella. A natural sterilizer, when water is stored in a copper vessel overnight, the element in very small quantities gets dissolved in water. This process, known in scientific terms as oligodynamic effect and has the power to destroy a wide range of pathogens that are commonly found in our water sources and known to cause severe illness. The reddish brown metal Copper is required by our body in trace amounts which are at a level of about 1mg/day. According to research, drinking about two liters water stored overnight can supply a majority of our daily requirement of copper. Also, American Cancer Society research says that copper has been found to help regulate blood pressure, heart rate and lowers ones cholesterol and triglyceride levels. Incidentally, with the growing incidence of deadly cancer, it is also known as an essential antioxidant to combat the disease. Copper is also known to regulate the functioning of the thyroid gland, prevents joint pain, aids in hemoglobin synthesis, maintains acid-alkaline balance in the body, helps in improving fertility and in the healing of internal wounds. 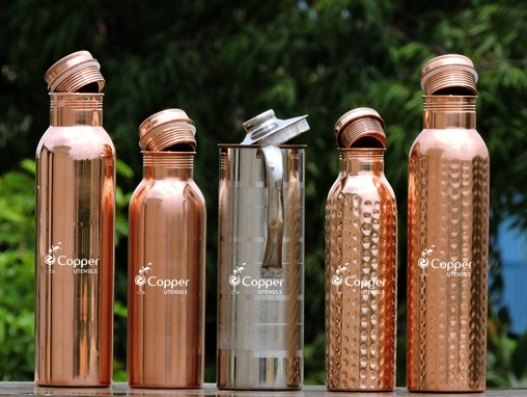 Incidentally, our specially designed copper vessels and bottles at https://www.copperutensilonline.com are uniquely designed to ensure that there is no leak or spill even whiletravelingg. So, slowly and steadily replace all the plastic vessels and bottles at home with copper ones and gift them to your friends and family so that everyone can enjoy and reap its numerous health benefits.